Fall is here. (Even though by the Chinese calendar we are in mid-autumn already.) I’m wearing a jacket. It is windy and cool. It is even cool enough for my favorite treat – green tea oatmeal. (It’s way more delicious than it sounds!) How long will this last? As predicted by our local meteorologist, September is turning out to be sensational flying weather. Despite the fact that today is a little rainy, visibility is great and the planes are in the air. The DH has been flying everyday for the past week. 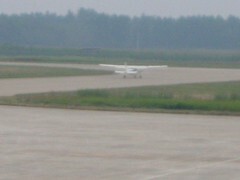 This is what we came to China to do, and it is a huge relief to see the instructors doing it! 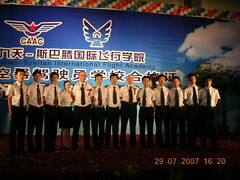 I’m writing some posts about the challenges of flight training in China and some other aviation in China themed stories. I should be posting them this weekend or next week, and then on a regular basis after that. It’ll be my “Aviation in China” series. In the meantime, I’m swamped with lots of reading and studying. When I left my last nursing job, I was so burned out that I never wanted to see a hospital or a sick person ever again, but I have to admit I’m really enjoying my medical librarian courses. I’m reading about infectious disease for a course, instead of my own pleasure, (I know, I’m twisted.) which is a huge change. I’ve never enjoyed reading a textbook before. Does this mean I have found my career? What I want to be when I grow up? I’m even watching medical dramas for fun. (House – Season 1) And sometimes, when I’m deep into an episode of House, and I have to turn to the DH and translate some of the medico-speak, somewhere down in a corner of my mind, I actually miss the hospital, just a little, tiny bit. It is a little frustrating that I am studying about libraries in a country where I can’t actually read a book. 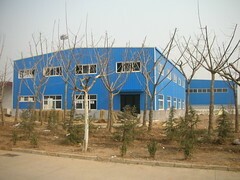 In Linyi, there is no public library, and even if there were, I’m sure the English section would be minute. It’s times like these when I wish I was in a big cosmopolitan city like Beijing, Shanghai or Hong Kong. There I might have possibilities of working in a library. Still, I have some outlets here. I want to build a virtual aviation library for our school and I’ve been reading about an interesting library project going on in China. Library Project is an organization that donates books and libraries to school and orphanages in developing countries. If there is a way I can be involved in this project, I’d love to be. More on that later. Another gorgeous day today – not a cloud in the sky. The DH and F. (another flight instructor) have been flying non-stop all afternoon. Yesterday, they flew 8 hours straight. Almost all of the students are now on their third or fourth flights and I must admit it makes me feel great to see their smiling faces. I spoke with a few students yesterday and they told me all about their flights, their fears, their excitement. They have been waiting over a year for this to happen. If the weather and Chinese military (who control the airspace) continue to cooperate, some of the students might be soloing by the end of next week. And to think when I first met them, most had never set foot in an airplane and didn’t even know how an engine works. 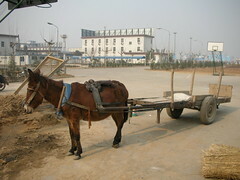 I don’t blog very much about work here in China. I’m not sure why, other than the fact that for the most part my work is monotonous and boring. However, we are experiencing interesting times right now – working for the second private flight school in China as it begins its flight operations. I think I will write more about what it is like to teach students basic aviation vocabulary and watch them as they learn more theory, practice in the flight simulators and finally, begin flying. Today that is not my concern, though. For the last few days, the DH has been up flying several times. 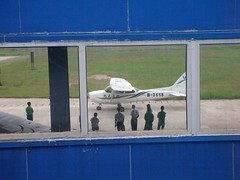 This is my view of the aircraft hangar and ramp area, from my office window. Here the DH and a FI are waiting for the taxi clearance from the control tower. I am not really afraid when the DH goes flying. I don’t really think about it too much, to be honest. It’s just what he does – and what he loves. And what he does really well. I know that he is highly capable, so I just don’t worry. I did, however, hold my breath slightly as the airplane began its ground roll and lifted off down the runway. 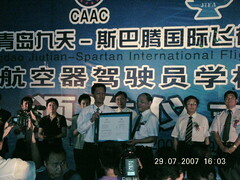 This past weekend, the flight school I work for, Jiutian International Flight Academy (JTFA), received certification from the Civil Aviation Administration of China (CAAC – China’s FAA). 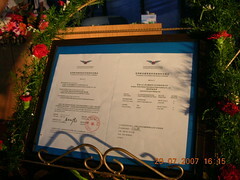 This means that we are officially a flight school and we can begin training. It also means that our airplanes can finally fly. 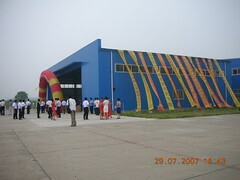 The hangar where the celebration took place. Posted in Aviation, China, Work | Comments Off on We Are Official! I will admit that I am probably not the best ESL teacher ever. I’m hardly qualified, having only taken a short course in English teaching. Half the time I am not really sure what I am doing, I just do it. My students, thank goodness, already have a decent grasp over English grammar. What they need is to use it. Speaking is not something that is emphasized in the classroom. I have 4 students in one class and 6 in the other. We all sat around a big desk and talked non-stop about the questions and other side stories that came up spontaneously. It was fun. Everyone talked. Everyone laughed. As you can imagine, vacationing in a place like Tibet – a place of arid beauty, incredibly blue skies and something rare for Asia – a sense of being the only human on the planet – can lead “home” to feel, well, a bit underwhelming. Combine that with the fact you actually have to do work, and you end up with very few blog posts! Yes, I am indeed suffering from blog-o-lazitis. How can I make “worked all day, bought an ironing board, went to sleep” interesting? I’m working on it, I promise. At work, we are in the final days of our preparation crunch for an important meeting with the CAAC (FAA of China). If all goes well, in a few weeks our school should be certified. We’re all working hard to ensure everything gets done, and since I don’t have internet at home yet, I haven’t had time to blog at work. So this weekend looks like a good time to get some thoughts on paper and refresh the blog! As I’ve told you before, our academy base is fairly new. 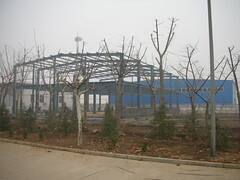 When we first arrived, our boss told us the academy would be building a new classroom and office building, and it would take 2 months to complete. 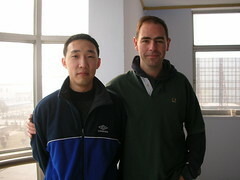 One of the students, Gavin, is from Qingdao, and today he travelled 4 hours by bus to see us. 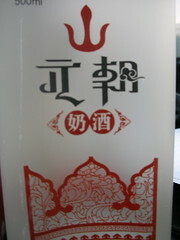 (He is home for the Chinese New Year holiday.) We had lunch together and caught up on all the gossip and goings-on. He presented us a bottle of some kind of liquor possibly made from, as far as we can tell, either cow, camel or yak milk. 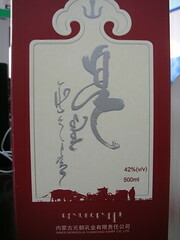 Everything on the box is in Chinese, except for the name of the producer, Inner Mongolia Yuanchao Dairy Company. (Our students are now studying in a city in Inner Mongolia.) Should be very interesting to taste!